So long, trusty tag-line! | "Jump Higher!" It’s been a while since I’ve posted, but that’s because I’ve been swamped with homework. And on that note… big news! 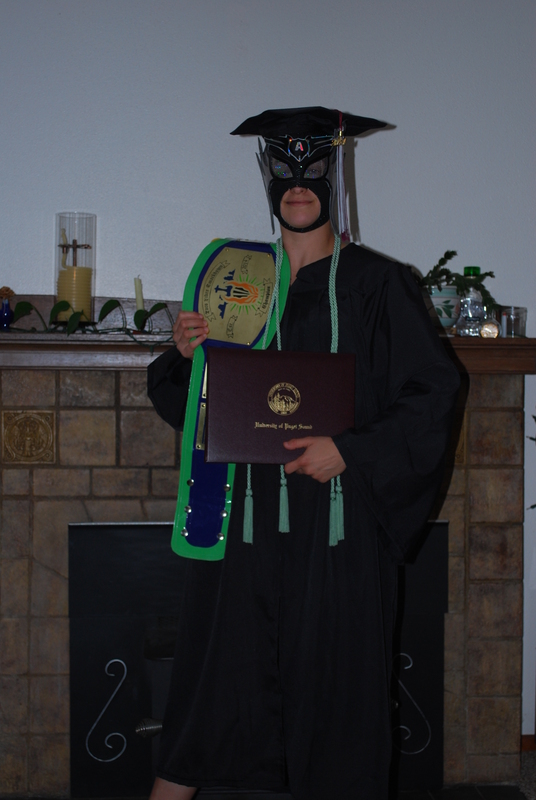 For the last three years I have used the rather catchy and completely accurate description, “College student by day, luchadora by night.” But as of this week half of that sentence will no longer be true. That’s right, folks; I’m officially graduating college! Goodbye homework, hello life as a real adult. A smidge terrifying, I’ll admit, but nothing a luchadora can’t handle. Some of you may wonder what that means for my lucha libre career. Fear not, lucha fans! I started training lucha libre when my college journey began, but the end of my studies does not signal an end to my sporting days. As current plans stand I will not be abandoning the general Seattle/Tacoma area, which means that I can continue to train hard at Lucha Libre Volcánica and help bring you the best (and only) lucha libre in the Pacific Northwest! I’m not exactly sure what my post-college life will look like quite yet but I can assure you that it will involve lucha libre. And now that I’ll (hopefully) have more free time, keep an eye out for all the blog posts that’ve been put on the back burner until after finals!